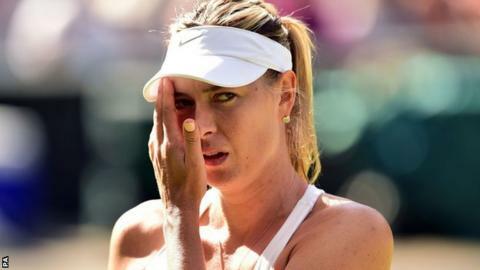 Maria Sharapova will enter Wimbledon qualifying rather than request a main-draw wildcard as she continues her comeback from a 15-month drug ban. The 30-year-old Russian was denied a wildcard for the French Open, with tournament officials saying her doping suspension counted against her. Sharapova will have to win through three qualifying rounds to earn a spot in Wimbledon's 128-strong main draw. Qualifying in Roehampton will be ticketed for the first time this year. "Because of my improved ranking after the first three tournaments of my return, I will also be playing the qualifying of Wimbledon in Roehampton, and will not be requesting a wildcard into the main draw," said Sharapova in a statement on her website. Sharapova is ranked 211th in the world - below the status needed for direct entry into the main draw - but her recent form is good enough to earn a place in qualifying. Had she reached the Italian Open semi-finals last week, Sharapova would have climbed high enough to make the main draw automatically, but she retired in her second-round match. Had she applied for a wildcard it would have been reviewed by a Wimbledon committee, with a decision to be announced on 20 June. Wildcards are "usually offered on the basis of past performance at Wimbledon or to increase British interest". The Women's Tennis Association criticised the basis for the French Open's decision, saying there are "no grounds to penalise any player beyond the sanctions set forth in the final decisions resolving these matters". Sharapova herself tweeted in apparent response to Roland Garros' decision. "If this is what it takes to rise up again, then I am in it all the way, everyday," she wrote. "No words, games, or actions will ever stop me reaching my own dreams." However, former Wimbledon champion Pat Cash was one of several prominent figures urging the All England Club not offer the 2004 champion a route straight back into the main draw. Tickets to Wimbledon qualifying will be £5 each, with all funds going to the Wimbledon Foundation.